The Mines and Geosciences Bureau Regional Office No. XIII supported the various activities of the 2019 National Women’s Month Celebration. It took part in the 9th General Assembly, Opening of the Women’s Month Celebration and Press Conference spearheaded by the Regional Development Council – Regional Gender and Development Committee on March 1, 2019 at VCDU Prince Hotel and Grand Convention Center in Butuan City. Similarly, MGB RO No. 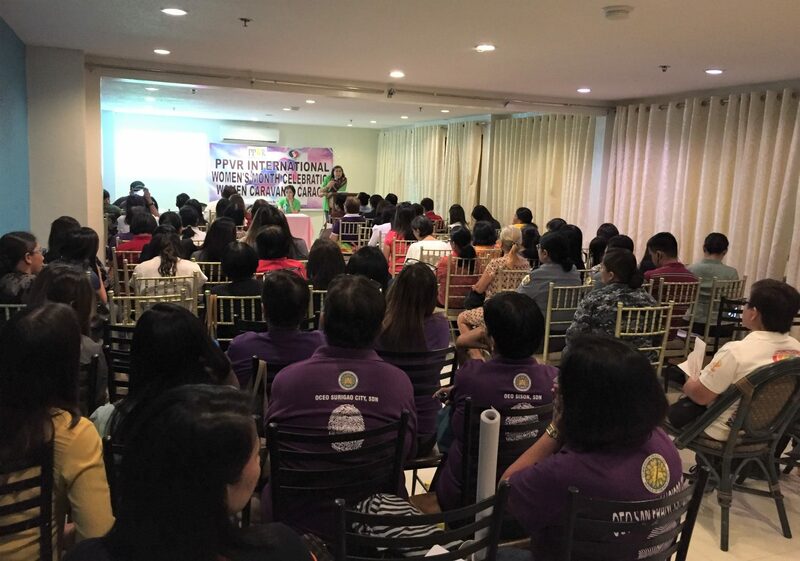 XIII personnel attended the RGADC-led Women Summit during the International Women’s Day Celebration on March 8, 2019 at Butuan Grand Palace Hotel in Butuan City. At the said summit, RGADC Caraga recognized and celebrated the political, social, economic and cultural achievements of outstanding women from various government agencies and sectors in the region. At the local level, MGB RO No. XIII participated in the “Panawagan sa Eleksyon sa Kababaihan” which is a forum on clean and honest election conducted by the Commission on Human Rights and the People Power Volunteers for Reform (PPVR) of Caraga on March 13, 2019 at Hotel Tavern Annex in Surigao City. During the forum, Ms. Concepcion C. Asis, PPVR Regional Chairperson, urged the participants to vote for honest, meritorious, qualified and patriotic candidates in the upcoming 2019 national and local elections. MGB RO No. XIII personnel also supported the Women’s Summit organized by the Provincial Government of Surigao del Norte on March 27, 2019 at the Provincial Gym in Surigao City. At the event, Gov. Sol F. Matugas and Provincial Government Officials awarded the Outstanding Women of Surigao. On the same note, Usec. Diosita “Jojo” Andot, Office of the Presidential Adviser on the Peace Process (OPAPP) Undersecretary for Peace and Development, gave a talk on Understanding Women, Peace and Security. “Gender is a key and a critical dimension to the attainment of peace and development,” Usec. Andot imparted. At the summit, MGB RO No. XIII personnel disseminated Magna Carta of Women brochures to better inform the participants of their rights. Republic Act No. 9710 or the Magna Carta of Women of 2009 is a comprehensive women’s human rights law that seeks to eliminate discrimination against women by recognizing, respecting, protecting, fulfilling and promoting the rights of Filipino women, especially those in the marginalized sector.